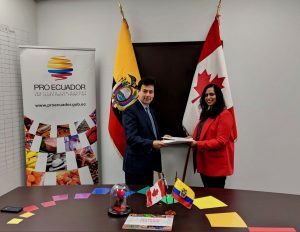 TORONTO March 3, 2019 – The Canadian International Resources and Development Institute and the Vice Ministry of Mines of Ecuador signed a two-year Memorandum of Understanding that solidifies their collaboration in support of inclusive, sustainable mineral development in Ecuador. The two Institutions have expressed their intention to cooperate in the areas of strengthening of the integrated resource management; improving public sector capacity and governance; engaging communities and sharing benefits, through empowering national, provincial and municipal leaders and decision makers, while focusing on in-country learning and on providing opportunities for global knowledge sharing. 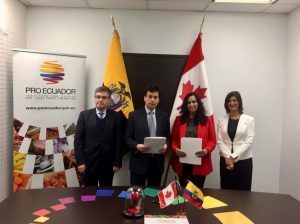 “CIRDI looks forward to continuing to build on our strong partnerships with the Government of Ecuador, and all our local partners toward the shared vision of a dynamic and sustainable mineral sector,” said Priya Bala-Miller, CIRDI’s Director of Partnerships and Program Development. CIRDI and the Vice Ministry of Mines already collaborate on strengthening of the Ecuadorian small-scale mining sector through TransMAPE program led by Francisco Gallegos since 2018. Through data collection, consultative dialogue and pilot training modules, the project has been working collaboratively with the Ecuadorian government to develop a long-term education and training program for miners and regulators. The project aims to blend Canadian and Ecuadorian technical expertise and experience to contribute, through education, to the development of a more socially and environmentally responsible small-scale mining sector in Ecuador. The new agreement will foster knowledge sharing, access to experts, and opportunities for activities and events.